July has been a very busy time, what with all the watering (it’s been hot and dry), squishing of bugs, and weeding, not to mention flax harvesting. 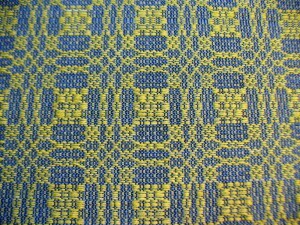 However, I recently did a tiny bit of weaving for my double-weave study group with the Pioneer Valley Weavers Guild, led by the elegant and brilliant Barbara Elkins. 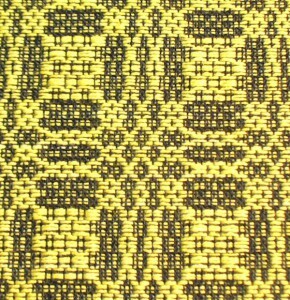 Doubleweave is a versatile technique that lets you weave two layers of cloth at the same time. The layers can be joined at the right or left edges, joined at both edges, they can be totally separate, or they can exchange periodically (i.e., the bottom layer comes to the top and the top layer goes to the bottom). 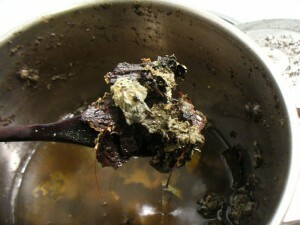 Our samples used four shafts, which is the minimum number you need. 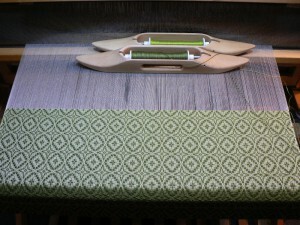 The whole process has been full of visual surprises, beginning with winding the warp. For our samples, we wound a warp with two alternating colors. I chose black and white for maximum contrast. 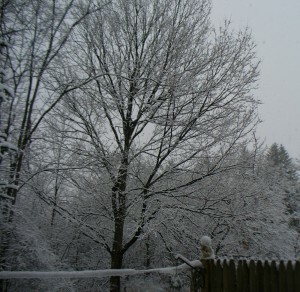 On the left, below, is the cross with my counting thread. You can see the separation of the white and black layers. 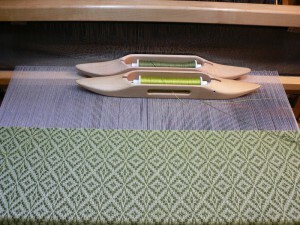 On the right is the warp as I was beaming on. 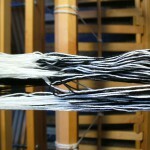 The alternating black and white ends get sorted into their respective layers when they go through the lease sticks. 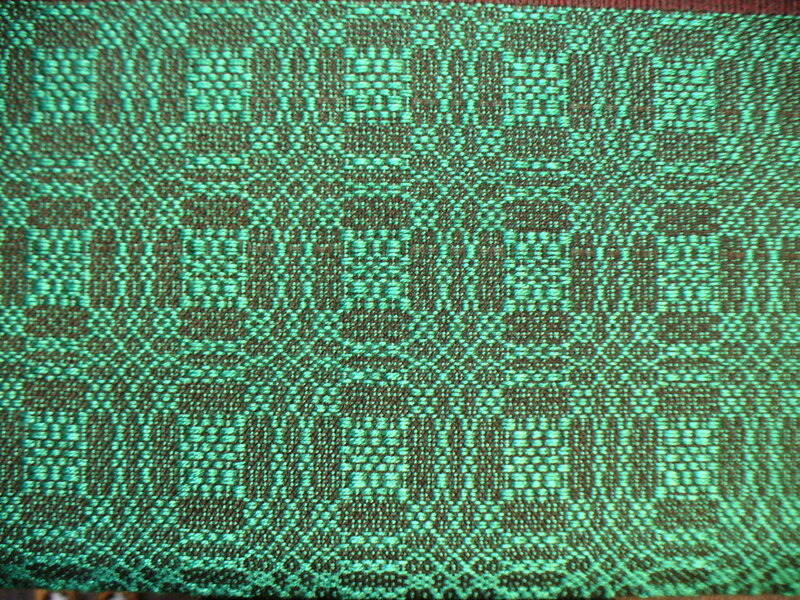 In the section of the warp that hasn’t yet been beamed on there is a cool transition between where they alternate and where they become separated. 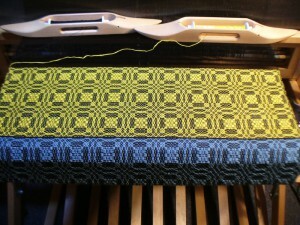 I warp back to front, so this un-separated section is in the front of the loom. 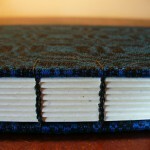 This weekend I sewed together the last of the books from the Young Lovers Knot warp. 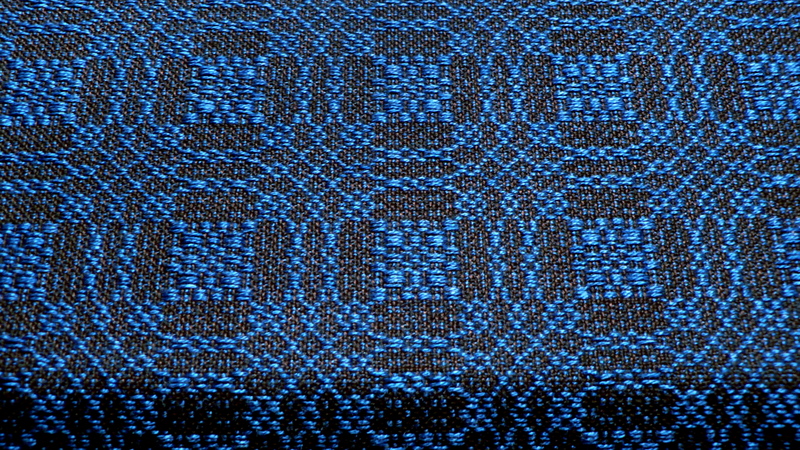 Three have blue 10/2 tencel for the pattern weft (the color is called Moroccan Blue from Textiva Yarns) with black 20/2 tabby weft. 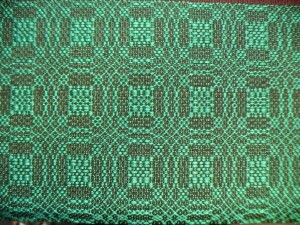 One has a copper-colored 10/2 cotton pattern weft (a UKI color called Mead) with black 20/2 tabby, and one has green 10/2 tencel (Emerald Green from Textiva Yarns) pattern weft with 20/2 black tabby. Here are a few more details about them. 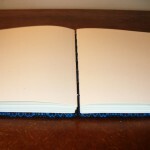 The coptic binding lets the journal open flat as you write. This is an advantage because you can write anywhere (e.g., sitting snug in bed with your journal propped on your knees). Also, you don’t waste any paper because you can write all the way to the edges. These journals are meant for writing, rather than drawing or painting. The paper is smooth, so you can write without bumps and lumps. Any kind of pen will work (except Sharpie bleeds through). I prefer old-fashioned ball points, my pen of choice for decades. The paper isn’t too plain, though, it has visual texture, with little flecks of light brown against the cream-colored paper. The spines are exposed so you see the folds of the signatures, and the coptic stitch is decorative. I like how the stitching extends the feeling of the threads in the cloth on the covers. It makes the books feel connected, like the covers and pages grew together. 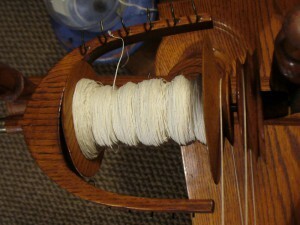 Matching the color of the waxed linen thread with the yarns in the cover is fun, though not straightforward. I bought certain colors of waxed linen thread specifically because they matched the yarns I have. 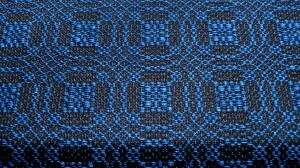 But when the cloth is all woven together, interactions between the pattern yarn and the tabby yarn create new color effects. 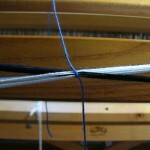 This is always true with weaving, but it happens in a particular way with overshot because of the interactions of the tabby weft with the pattern weft, as well as the warp. 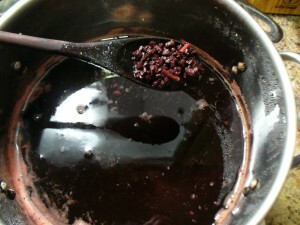 Because of these interactions, two colors that were similar when compared one-on-one no longer look alike. I prefer the color of the waxed linen thread to blend into the cloth on the covers. 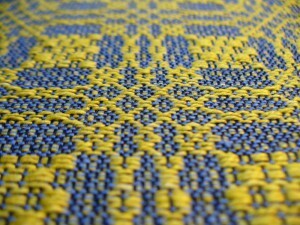 To me it adds to the feeling that the cloth and the stitching are one process or one structure. “These books were handmade by Michelle Parrish of Local Color Dyes and Wood Thrush Weaving – Amherst, MA. 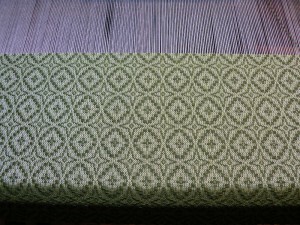 I hand wove the cloth for the covers using cotton, tencel, and cotton-linen blend yarns. 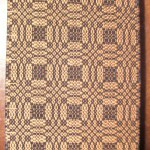 The pattern is a variation on a traditional overshot motif called “Young Lovers’ Knot.” I sewed the books with a Coptic binding using waxed linen thread. 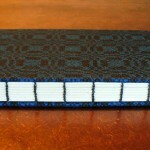 In addition to being decorative, the Coptic binding allows your book to lay flat as you write. The writing paper is 50% post consumer recycled, acid free, and FSC certified. Though all the books in this series share the same pattern, each book is one of a kind. I made these books so that people could write in them. Writing helps me make sense and meaning of my life, to re-tell and remember, to think, plan and decide, and to create continuity and a sense of personal history over time. It connects me to myself. I have kept a journal since I was 7 years old. The overshot pattern on the cover holds a story of its own, and is connected to a longer history. 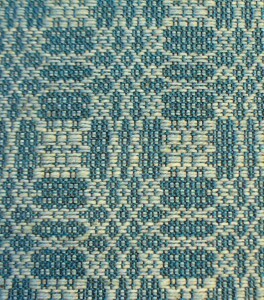 In times past, these patterns were woven with linen or cotton and wool, and made warm, durable bed covers. Many old coverlets were made entirely by hand and represented months of work: the linen was grown, processed, and spun, and the wool sheared, washed, spun, and dyed, by the weaver and her family. 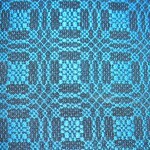 There are hundreds of traditional overshot patterns, many with evocative names. Each of us lives a unique story of our own, but we are all connected to one another, past and present, through the fabric of life. I hope one of these books will connect you to others who labored, created, lived and loved, and passed their stories to us in the form of these traditional patterns.